On Friday, June 21, approximately 300 people attended the Imagine! CORE/Labor Source art show and performance “Imagine! Presents” at the Dairy Center for the Arts in Boulder. More than 250 people stayed after the art show to attend the performance, and it was truly a standing room only audience. The performers enjoyed having such a lively and appreciative audience. The Imagine! art will be on display at the Dairy Center for the Arts, located at 2590 Walnut Street in Boulder, through July 12. Gallery hours are: Monday and Tuesday, 9:00 AM – 5:00 PM; Wednesday through Friday, 9:00 AM – 8:30 PM; and Saturday and Sunday, 1:00 – 8:30 PM. Below are some photos from the art show and performance. Enjoy! Candace with two pieces of her art. Mandy reads an original poem. Rebecca, Erika, and Lindsey sign while the others sing. Today’s installment of “50 Years, 50 Stories” comes from Kevin Nelson, who worked at Imagine!’s Labor Source department back in the 1980s, and now, many years later, serves on Imagine!’s Board of Directors. It offers a great double perspective. Thanks so much for sharing, Kevin! Like so many things in life, my association with Imagine! began by chance. I was a student at the University of Colorado, and one day in one of my psychology classes a guy by the name of Steve Dawes came in to give a presentation. Steve worked at a place called the Developmental Disabilities Center (an earlier name of Imagine!). Steve’s presentation included a demonstration of something he called “picture cue communications,” which was a way to facilitate communication with non-verbal individuals. At the end of his presentation, Steve asked if anyone would be interested in volunteering at the DDC to work on picture cue communications with some clients. To this day, I have no idea why I raised my hand, but I did. I ended up volunteering, working with five adults with limited verbal abilities. We put together booklets with pictures of things such as their favorite foods or favorite restaurants. The clients would point to the pictures so they could indicate what they wanted, a low-tech precursor to some of the computerized communication devices used by Imagine! clients today. I loved everything about my volunteering experience, so when I graduated in 1985 I went to work for Imagine!’s Labor Source department. This was at the tail end of the de-institutionalization that happened across the country, which meant I worked with many clients who had significant behavioral issues. But with those issues came opportunities for staggering changes. I saw some brilliant behavior plans that made life-altering differences for some of the folks we were working with. After about two years of working at the DDC, I went to California and started a vocational program in Sacramento. I must say I was treated like a genius when I was out there because the ideas I was presenting seemed so radical. But the truth is, almost every idea and program I suggested was stolen directly from what I saw and learned during my time at Labor Source. After another stint with Labor Source, I went back to school to get an MBA and pursue a different career path. But my experiences of working at Labor Source remained some of my fondest memories. So, close to twenty years later, when I got a chance to join the Board of Directors of Imagine!, I jumped at the opportunity to become re-engaged with an organization that had meant so much to me. Reconnecting with Imagine! almost two decades later was like moving from a stagecoach to a Ferrari! The innovative approach to services I had seen first-hand when I was at Labor Source had increased exponentially. Although the services had changed in many inspiring and exciting ways, it was also nice to see that so many people I had known when I had first worked for Labor Source were still around and still dedicated to making a positive difference in the lives of people with developmental disabilities. I’m just as proud to be associated with Imagine! today as I was back in the 1980s when I was working for Labor Source. Congratulations on 50 years! Recently I heard someone use the phrase, “that’s below his pay grade.” The little voice in my head interrupted with, "what?" Picture a deer grazing in an open field interupted by an unatural sound, head up, "what did I just hear?" The phrase came up in response to queries as to why an organization head was unaware, or hadn't responded to, or worked on, a particular challenge or issue. Granted this was in reference to a bureaucratic environment where a statement like this is probably not out of the ordinary. I won’t mince words here. I hate that phrase. Not only because it smacks of elitism, but also because it is really just a way of passing the buck. Rather than creating accountability, it shirks responsibility. And in our work, that style of management does nothing to better the lives of those we serve. I do not hear that phrase used at Imagine!, and that makes me very happy. Supervisors here accept and acknowledge that nothing is beneath their pay grade. This doesn’t mean that a supervisor or manager will be the one to do the work required to address the issue or challenge, but they are willing to delegate authority, assign responsibility, and take an active role in making sure the issue is addressed. Even more impressive, what I see at Imagine! all the time is people going above their pay grade. The history of this organization (which I hope you are learning about through our “50 Years, 50 Stories” series) is a history of people stepping up, taking on challenges even if those challenges aren’t part of his or her “official” duties, and addressing needs in creative ways. In the past few years, we’ve been able to attract an especially high caliber of employee. 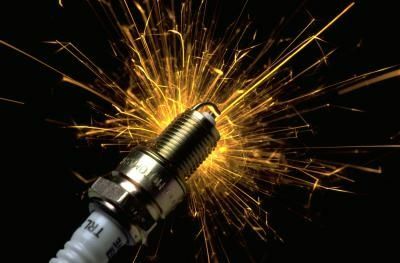 Many employees on the front lines and in middle management positions have acted as spark plugs at Imagine!, igniting the fuel and creating the combustion needed to keep us moving forward. Many of these spark plug employees will be the people driving Imagine! in a few years, and I am confident that they will continue our tradition of innovation and leadership in the field. I hope readers of this blog are aware that 2013 marks Imagine!’s 50 Anniversary. We’re not just collecting and sharing stories, we’re planning a big party as well, and you are invited! 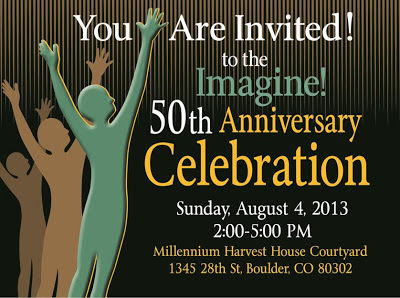 Imagine!’s 50th Anniversary Celebration is scheduled for Sunday, August 4, 2013, 2-5 PM at the Millennium Harvest House Courtyard, 1345 28th St., Boulder, CO. Join us as we celebrate 50 years of building quality lives with music, games, light refreshments, Imagine! giveaways, and a video of Imagine! through 50 years. This event is FREE and open to the public. Please share this news with anyone you think might be interested in attending. We’ve even made it easy to RSVP. Just click here. This is the 25th installment of our “50 Years, 50 Stories” feature. We’re halfway there! I hope you have enjoyed this series as much as I have, and have learned more about the positive impact Imagine! has had on so many during our 50 years of existence. To mark the halfway point of this series, we thought we’d do something a little different for this week’s installment. Instead of a person’s story, we thought we’d share a timeline of key events in the history of Imagine! and in the field of serving individuals with developmental disabilities. This timeline is another story, just a story told in a different way. It also helps give some of the other stories in this series perspective. I want to note that some of the dates are approximate. Sometimes we get so wrapped up in our work that we don’t properly record important events, or we might not even be aware the importance of certain dates until much later, when we have to rely on our imperfect memories to fill in the blanks. So if you see any dates you know are incorrect, or if we left something out, leave a note in the comments below and we’ll fix it. President John F. Kennedy gathers a distinguished panel of experts to develop "A National Plan to Combat Mental Retardation." What is to become The Association for Community Living is formed in Boulder as a resource for individuals with intellectual/developmental disabilities, their families, friends, and community. On February 5, 1963, President John F. Kennedy makes a speech to the Congress of the United States, where he announces the panel's findings and asks for support for new resources to address the needs of people with mental retardation and mental illness: the Maternal and Child Health and Mental Retardation Planning Act, which grants $265 million in federal aid over five years to support programs for the mentally retarded, and the Mental Retardation Facilities and Community Mental Health Construction Act, which grants $330 million over five years for new buildings to serve disabled citizens. Colorado House Bill #121, providing for a pilot program relating to community centers for mentally retarded and seriously handicapped person, is passed. Boulder is chosen to administer the program, and the Boulder County Interagency and Citizens Council on Mental Retardation is formed. Ruth Wood is named Executive Director. 100 individuals are served. A pilot program moves 90 residents of institutions with developmental disabilities into the community of Ft. Logan, within three years all 90 were living successfully in the community. The Boulder County Interagency and Citizens Council on Mental Retardation is renamed The Boulder County Board for Mental Retardation. The Mental Health and Mental Retardation Center of Boulder County, Inc., is formed by 20 interested citizens as an non-profit corporation to receive federal matching funds, foundation grants and local public and private support for the purpose of constructing a combined mental health and mental retardation center. Boulder County was the first community to consider a combined mental health and mental retardation center in the United States. The President’s Committee on Mental Retardation is established by President Lyndon B. Johnson. "Christmas in Purgatory," by Burton Blatt and Fred Kaplan, documents conditions at state institutions for people with developmental disabilities. “A First Report To The President On The Nation's Progress And Remaining Great Needs In The Campaign To Combat Mental Retardation” is released. Survey shows that 74% of individuals with developmental disabilities living in institutions in Colorado have no contact with anyone outside of the institutions. Carmel House in Boulder opens its doors to 14 people who moved out of state institutions. The Boulder County Board for Mental Retardation serves 140 individuals. Geraldo Rivera, an investigative reporter for WABC-TV in New York, conducts a series of investigations at Willowbrook State School in New York, a state-supported institution for children with intellectual disabilities, uncovering a host of deplorable conditions, including overcrowding, inadequate sanitary facilities, and physical and sexual abuse of residents by members of the school's staff. The exposé, entitled "Willowbrook: The Last Disgrace," garners national attention about the conditions in institutions. In New York ARC v. Rockefeller, parents of residents at the Willowbrook State School in Staten Island, New York file suit to end the appalling conditions at that institution. Social Security Amendments of 1972 creates the Supplemental Security Income (SSI). The law relieves families of the financial responsibility of caring for their adult disabled children. U.S. Rehabilitation Act of 1973 prohibits discrimination on the basis of disability in programs conducted by Federal agencies. Boulder County Board for Mental Retardation moves from the old county hospital building to the newly built Mental Health and Mental Retardation and Sundquist Rehabilitation Center on Iris and Broadway and serves 180 individuals. The Boulder County Board for Mental Retardation is renamed The Boulder County Board for Developmental Disabilities. Education for All Handicapped Children Act requires all public schools accepting federal funds to provide equal access to education for children with physical and developmental disabilities. This act is later revised and renamed as Individuals with Disabilities Education Act (IDEA) in 1990. The Boulder County Board for Developmental Disabilities begins providing Early Intervention services and serves 250 people overall. 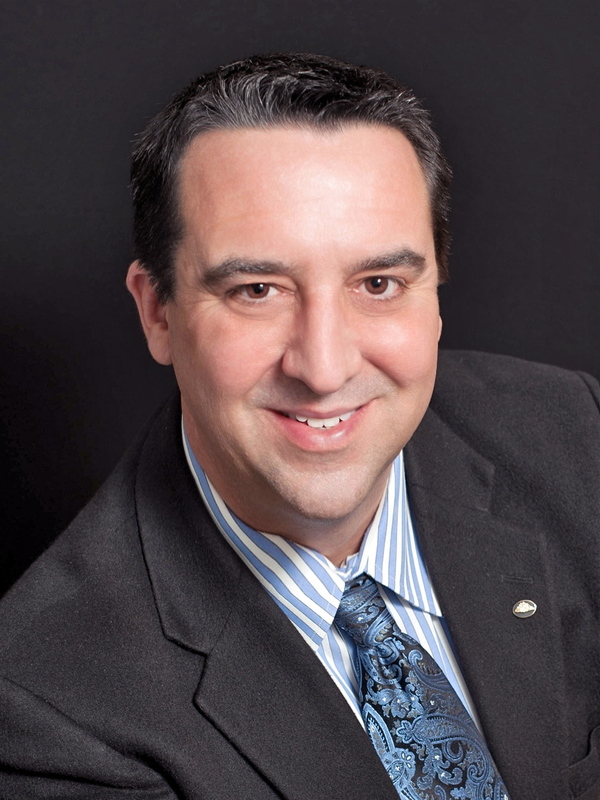 Don Coloroso becomes Executive Director of The Boulder County Board for Developmental Disabilities. The White House Conference on Handicapped Individuals 3,000 disabled people to discuss federal policy toward people with disabilities. It results in numerous recommendations and acts as a catalyst for grassroots disability rights organizing. Part B funds create ten new centers for independent living across the U.S. The Boulder County Board for Developmental Disabilities serves 420 individuals. The International Year of Disabled Persons begins. During the year, governments were encouraged to sponsor programs bringing people with disabilities into the mainstream of their societies. The parents of “Baby Doe” in Bloomington, Indiana are advised by their doctors to decline surgery to unblock their newborn’s esophagus because the baby had Down's syndrome. Although disability rights activists try to intervene, “Baby Doe” starves to death before legal action is taken. A group of parents of children with autism, along with the Colorado Chapter of the Autism Society of America, establish Chestor House, Inc. as a single group home housing eight people with disabilities. John Taylor becomes Executive Director of Boulder County Board for Developmental Disabilities. The Boulder County Board for Developmental Disabilities is renamed The Developmental Disabilities Center. An Adult Day Services program is established, forming the foundation of what is to become CORE/Labor Source. The Developmental Disabilities Center serves 600 individuals. The Alliance for Technology Access is founded in California by the Disabled Children’s Computer Group and the Apple Computer Office of Special Education. The Developmental Disabilities Center opens the Red Balloon Daycare Center, the first local day care that integrates children with and without developmental disabilities. The Americans with Disabilities Act is signed into law, prohibiting discrimination on the basis of disability. The Developmental Disabilities Center serves 750 individuals. The Developmental Disabilities Center serves 780 individuals. The Developmental Disabilities Center’s Early Intervention service program is renamed Dayspring. The Developmental Disabilities Center serves 840 individuals. The Developmental Disabilities Center serves 870 individuals. The Developmental Disabilities Center serves 900 individuals. The Telecommunications Act passes and requires that computers, telephones, closed captioning, and many other telecommunication devices and equipment be made accessible to individuals with disabilities. The Developmental Disabilities Center’s Out & About program is formed, providing community-based services within a therapeutic framework in response to the requests of community members with disabilities and family members who care for those with disabilities. The Developmental Disabilities Center draws up blueprints for a new building in Lafayette. In Olmstead v. L.C., the U.S. Supreme Court rules that unnecessary institutionalization of people with disabilities constitutes discrimination and violates the ADA, that individuals have a right to receive benefits in the "most integrated setting appropriate to their needs," and that failure to find community-based placements for qualifying people with disabilities is illegal discrimination. The Developmental Disabilities Center moves from Boulder to Lafayette. The Developmental Disabilities Center establishes an endowment with the Boulder County Community Foundation and initiates efforts to establish its very own Developmental Disabilities Center Foundation (later named The Imagine! Foundation). The Developmental Disabilities Center serves 1,100 individuals. The Developmental Disabilities Center’s residential program is renamed Innovations. The new Developmental Disabilities Foundation (later renamed The Imagine! Foundation) has a very successful first year, raising over $175,000.00 in 2001-02. The Developmental Disabilities Center runs a very successful mill levy campaign in Boulder County, which increases the stability of services for people who live in Boulder County. The Developmental Disabilities Center is renamed Imagine!. Imagine! Behavioral Health Services (IBHS) is created. A coalition of disability rights advocates and organizations holds the first Disability Pride Parade. Organizers expect 500-600 people to attend the event, which is designed to "change the way people think about and define disability, to break down and end the internalized shame among people with disabilities, and to promote the belief in society that disability is a natural and beautiful part of life." Almost 2,000 attend. Imagine! engages in negotiations with the Mental Health Center to be the Medicaid contract entity for people with developmental disabilities who are dually diagnosed. Imagine! serves more than 1,800 individuals. The Road-to-Freedom tour kicks off. This 50-state bus tour and photographic exhibit chronicles the history of the grassroots "people's movement" that led to passage of the Americans with Disabilities Act (ADA). Mark Emery becomes Executive Director of Imagine!. Imagine! breaks ground on its first SmartHome, the Bob and Judy Charles SmartHome in Boulder. Imagine! breaks ground on its second SmartHome, the Charles Family SmartHome in Longmont. Imagine! pilots “The Companion Home Model,” services to individuals (adults) living in their own homes or the homes of their family members. Imagine! serves more than 2,850 people and their families. Imagine! celebrates its 50th Anniversary. Yesterday morning I was listening to a Harvard Business Review podcast and heard a fantastic interview with Scott Barry Kaufman, the author of Ungifted: Intelligence Redefined. Kaufman covers ground in this interview that should touch everyone. His concepts will give hope to anyone who ever felt trapped by a label, or knows someone who is trapped by a label. Understand engagement as it relates to intelligence. People with the label of intellectual disabilities can realize potential beyond expectations. Hear how to revive motivation through harmonious passion. This is worthy of a listen. Click here and check it out for yourself. In honor of the National Basketball Association Finals, today I’d like to share a history lesson about the NBA. Specifically, I’d like to talk about the implementation of the 24-second rule in the NBA. For those of you who don’t know, the 24-second rule says that every time a team gains possession of the basketball during the game, they have to attempt a shot within 24 seconds or turn the ball over to the other team. In just one example of how this was played out, on November 22, 1950, the Fort Wayne Pistons edged the Minneapolis Lakers 19-18 in a game where the teams scored a total of eight baskets. If you follow basketball at all, you know that score is in stark contrast with today’s high scoring, “run and gun” style of play. So what changed? Well, the NBA was a business. They needed fans to survive. And fans weren’t likely to sit through too many low scoring snoozefests. They wanted action and needed to see some baskets. So something had to change. The solution was brilliant in its simplicity. Danny Biasone, owner of the Syracuse Nationals, suggested a rule giving a team 24 seconds to attempt a shot or else lose possession of the ball. 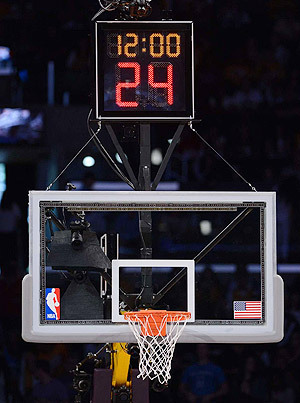 The 24-second shot clock made an immediate impact. In 1954-55, its first season, NBA teams averaged 93.1 points, an increase of 13.6 points over the previous season. The league survived and over time grew to be the staple of American sports culture it is today. Now, regular readers of this blog know that I’m not just sharing this story because it is interesting (or not, depending on your level of interest in professional basketball). No, I’m sharing because there is a parallel to what was happening to the NBA in the early 1950s to what is happening in the field of services for individuals with intellectual and developmental disabilities (I/DD) today. In short, the rules are acting as an impediment to giving the end user what he or she needs and wants. It is no secret that the people on the receiving end of services in our field would say they are not getting what they need. Rules and regulations frequently mean that services are delivered to meet the needs of the regulators, not the ones being served. And service providers are less efficient when delivering those services as administrative costs rise in response to the necessity of meeting more and more regulatory edicts. Just like the rules in early 1950s basketball slowed the game down, the rules in the 2013 I/DD world are slowing down opportunities for the folks we serve. We are in need of our own version of a 24-second rule. We need more fast breaks and fewer fouls. Something simple to speed up the pace and deliver what the end user wants and needs. Let’s do it before the clock runs out. The following post first appeared on the Imagine! Voices blog last week. It was so cool I thought I'd share with you all today. Enjoy. This is a photo album of pictures taken at John’s softball game last Tuesday evening. John is in a Unified Softball League through the City of Boulder's Parks and Recreation EXPAND program in which teams are comprised of people with and without developmental disabilities. John is a resident at Imagine! 's Bob and Judy Charles SmartHome and had invited the photographer to the game in an audio email last week. Residents at that SmartHome have access to an email program that allows people with limited writing and/or typing skills to send audio emails to their friends and family. EXPAND program's Unified Softball League. EXPAND program's Unified Softball League, stands on base. John uses perfect form getting his glove down to field this ball. John's coach Jill, behind him, had just been instructing John to put his glove all the way to the ground on ground balls and John shows he knows how to play shortstop. John and his coach Jill are pots of gold at the end of the rainbow. Today’s “50 Years, 50 Stories” comes from Peter DeHaas, and is a great example of how someone working for Imagine! spotted a gap in services and used his initiative, skill set, and experience to help overcome that gap. The history of Imagine! is a history of innovative thinking, and I firmly believe that is why we continue to be a leader in the field locally, state-wide, and nationally. Twenty years ago after I graduated from a tiny Liberal Arts university in Eastern Pennsylvania, like many young wanderers, I ventured west to Colorado with the hopes of exploring the great Rocky Mountains and perhaps finding a job along the way. I spent a short month in Greeley washing dishes at the Egg & I and staying with my sister until I found myself couch surfing in Boulder Heights and sacking groceries at the Ideal Market. While working at Ideal Market, every day a group of folks being served by Imagine! would venture into the store after they’d finished their work at the Hungry Toad restaurant across the street. I soon found myself becoming acquainted with this group and knew them all by name. Before too long, I applied for a job with a department of Imagine! called Labor Source as an Employment Specialist. I had no idea what I was getting myself into. Gary Stebick interviewed me and was reluctant to hire me because he thought I’d be too timid with the behaviorally-challenged consumers that Labor Source was serving. Needless to say, Gary took a chance on me and came to the Ideal Market to offer me the job and a ticket to see the brand new Colorado Rockies baseball team. We drove to the game across all the back roads to Denver in his tiny gray Toyota. Shortly after I started working at Labor Source, I recognized that many individuals we served had specific communication needs and benefitted from the use of basic sign language. Many of the Labor Source staff members were interested in learning sign language, but I realized that many weren’t fully utilizing or retaining the signs that they had learned. Suddenly I felt my life come full circle. My sister had taught be the signed alphabet in 3rd grade, and I had a close friend in middle school who was deaf. My communications with my friend had been very limited, and I was often frustrated with our finger spelling and lip reading back and forth. I had always wanted to learn American Sign Language (ASL), and now was my chance. Mark Emery must have thought I was crazy as I was taking and then organizing basic sign language trainings. Needless to say, I continued my pursuits of studying ASL until I was eventually teaching classes at the Developmental Disabilities Center (Imagine!’s former name) and providing more 1:1 communication development with some of the consumers. Twenty years later, I have my MA in Linguistics, and I teach ASL at the post-secondary level and work for one of the leading disability rights organizations in the state. Had it not been for Gary Stebick taking a chance on me twenty years ago, I wouldn’t be where I am now. I am forever grateful for all the experiences, educational opportunities, and friendships that sprung from Imagine!. Thank you all. Today, I’d like to provide an update on Imagine!’s involvement in “Intersections,” a collaboration between Imagine! and Boulder-based Moving to End Sexual Assault (MESA), funded by a grant from the Office on Violence Against Women. The ultimate goals of the grant are to facilitate sustainable system change at both MESA and Imagine!, and to help MESA as well as Imagine! staff and volunteers improve both organizations’ ability to serve people with disabilities who have experienced sexual assault. This project is not only a contemporary issue for Imagine!, as it will inform cultural awareness and policy changes, it can also be a vehicle for cultural awareness for the entire system of long-term services and supports for people with intellectual and developmental disabilities. This unique collaboration is already being recognized for its innovative thinking, and other organizations are interested in learning more. For example, Caitlin Looney, a Mental Heath Therapist at Imagine! and a key player in the collaboration, and Sanjukta Chaudhuri, the Project Manager for Intersections at MESA, are scheduled to present next week at the Colorado Advocacy in Action Conference in Vail, CO. Caitlin and Sanjukta’s presentation, entitled “83%: The Intersection of Disability and Sexual Violence,” will “engage participants in thought-provoking discussions that look at sexual assault with an inclusive lens. Through interactive activities, participants will acquire tools and implement practical use of skills to better serve survivors at the intersection of disability and sexual violence.” Considering that those at the ‘Intersection’ are three times more likely to experience sexual violence in their lives, and the overwhelming majority of mainstream services for survivors of sexual assault sidelines the needs of people with disabilities, this presentation seems especially relevant. Caitlin has also been invited to be a member of the planning committee for “Bridging the Gap: Creating a Community of Support for Survivors with Disabilities,” the 2014 National Conference on Sexual and Domestic Violence Against People with Disabilities, hosted by the National Center on Victimization and Safety, further demonstrating the buzz this collaboration has created in the human services field. Congratulations to Caitlin, Sanjukta, and everyone at Imagine! and MESA for involved in this vital project. This week’s edition of “50 Years, 50 Stories” comes from my friend and colleague Gary Stebick. As I mentioned in my story for this series, back in the 1980s, when we were both fresh faced new employees at Imagine!, neither of us planned on staying at the organization for more than a few months. Some 30 years later, we’re both still here. Gary’s story below helps to answer the question, "why?" 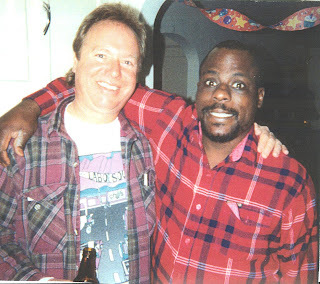 Gary Stebick (left) and his good friend Griggs. I’ve been at Imagine! for more than 30 years, and there are hundreds of stories I could tell. But something an Imagine! client asked me once captures my whole experience at Imagine!, and demonstrates why I have stayed here so long. For much of my time at Imagine!, I worked for Labor Source, helping people with developmental disabilities to find meaningful employment and contribute to their communities. One person I frequently worked with is named Griggs. Griggs had spent much of his early life in an institution, and had some pretty serious behavioral issues when he first began getting services from Imagine!. In fact, at one point we considered sending Griggs back to the institution because we weren’t sure we had the resources to help him to learn to manage his challenging behavior. Fortunately, Griggs was given another chance, and over time not only did his behavior improve, but he became gainfully employed on a work crew and turned out to be a valued friend. To this day, whenever I hear his voice or see him, I try to say “hi” and chat with him for a few minutes, always making sure I remind him that he’s a good guy. I told him I didn’t know how it works when someone dies, and I hoped that he would live for many more years, but if I was still around when he died I would sure appreciate it if he came to visit me because I would miss him, too. He didn’t say anything more, but it seemed to me by the look on his face that he was pleased with the answer. I think it may be the kindest thing anyone ever said to me, and when work gets tough, I always try to remember those words to remind me why what we do at Imagine! is so important. As much as I enjoy telling that story and reminiscing about the good old days at Imagine!, I am very excited about the many new things that are going on currently at Imagine!, especially through our clients’ use of technology. The way time flies, my tenure here will be finished soon enough, but I find great consolation in seeing the direction Imagine! is headed. We have a wonderful “new generation” of employees, and they continue to rise to the occasion time and time again as they encounter different challenges and opportunities than I had. And I believe our greatest asset continues to be the people we serve, who have an incredible desire to be successful citizens in our community, and, like Griggs, to be appreciated for trying so hard to be good people.